When Americans think of hospitality it usually involves having someone over to your home, or simply having a spirit of hospitality, as in being nice or welcoming. Last night I had the opportunity to experience a biblical definition of hospitality.Â The host pastor here in India drove six hours to meet us in Raipur then drove with us back to his home. The drive is not easy, it is over roads that are in great need of repair, and through a swirl of chaotic drivers, bicyclers, constant honking horns, and people on foot or pulling something. In India if it has wheels it is used for transportation of one kind or another. Â It is a jarring trip of sudden accelerations, close calls, and slamming stops. If you are not used to it, to is nerve wracking. Upon our arrival at the hotel where we were staying in his city there were native people there to welcome us with flowers, handshakes, smiles, and hugs. We rested for about an hour, where we then traveled to the pastorâ€™s home. Again, as we drove up there were people there to welcome us. We were ushered to chairs in the driveway and many children danced and sang for us as men played drums behind them. After the children sang several songs, and continued to sing and dance, women brought out small wooden platforms and shallow pots filled with water. 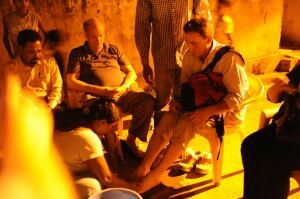 Then they bowed before us, removed our shoes and socks, and proceeded to wash out feet. I am not sure why this moment struck me so deeply, but as they washed my feet, I began to weep. It was very humbling. As the pastor led this effort, he said, â€œit is an honor and privilege to serve the holy people.â€ Who am I that they should wash my feet? Why did they feel the need to show this honor to me, and our group, and to serve us in this way? It was overwhelming. The Christians of India understand this very powerful display of love and respect to others. Â As followers of Christ we are to follow His example of being a servant to others and to show others their worth. Then we were led, hand-in-hand by the children to a room with a long table covered with various colored table clothes. Then one dish at a time, a wonderful meal was served. It included rice, a type of banana, a lintel yellow sauce, seared chicken, and potato balls, with water to drink. It was wonderful. Then at the end of the meal, the pastorâ€™s family came in and we clapped our hands for them.Â There was no question that these people were excited about us being there, and wanted us to feel very welcomed. If we look at Luke 7:36 ff. a sinful woman was just come into a Phariseeâ€™s home and broken a bottle of very expensive perfume to pour over Jesusâ€™s feet and then wiped the excess with her hair. For the women it was a great sign of admiration honor. For the Christian, hospitality becomes a desire to show another person how you view them. It is a Christian’s desire to honor them, and to show how thankful that they are in their home. So with this in mind, it is incredibly humbling when someone gives you this level of hospitality. It is my prayer that when I interact with others that they can see how much I love them by how I show them through acts of honor. On every mission trip I always walk away changed in some way. So far, I have a renewed appreciation for biblical hospitality and also a desire to show it to other people.Â What a wonderful way to show the world our love for them, to invite them into our homes, to honor them as treasured guests and to display Christâ€™s love as a humble people who have been forgiven of somuch, and want to share this love and how they can be forgiven with others. * Because India is a â€œclosedâ€ country to the gospel I have not given the pastorâ€™s name and did not show any pictures of him or his family.